Here are my new SuperFocus glasses. Not what I would've picked for myself for style, but they're getting compliments from strangers! It was a month back that I wrote about my presbyopia and SuperFocus glasses. My apologies for the delay on this test report. One of my prescription lenses was slightly off. That's not uncommon and had nothing to do with the SuperFocus frames, but I didn't want to report back until I was wearing exactly the right prescription. I decided within hours that SuperFocus glasses worked for me. Whether they will work for you depends on your tolerances for various "solutions" to presbyopia. Like other eyeglasses, SuperFocus glasses don't make your presbyopia disappear, they're just another way of dealing with it. See my previous column for my feelings about dealing with multiple pairs of glasses, bifocals, and progressives. No need to rehash that. (I did check out the new progressives and they are still not for me, for reasons I previously discussed). SuperFocus glasses are like having a whole bunch of glasses on my head at the same time and being able to switch back and forth between them in a few seconds with the touch of a finger. I can now get sharp vision at any distance, over my entire field of view. I do not get sharp focus at more than one distances at a time, as I would with bifocals. In my life, this is not a problem. The one place where I thought it might matter was driving, but with the glasses set to infinity the dashboard is still sharp enough for me. These are my old glasses. Personally, I like the big owl-eyed look, not to mention the large field of view. No accounting for taste, I know. The glasses are much smaller than I'm used to, as you can see from these first two illustrations, but I'm easily adjusting to the narrower field of view. I thought this would bother me more.The weight's also fine; at 31g, they're 2g less than my old glasses. By pure good luck, the range of focus is almost exactly right for my prescription (approximately –4 spherical, –.5 cylindrical). The +2.7 diopter adjustment range of the glasses puts my near focus limit at about 12 inches. When I'm not wearing any glasses, my eyes focus at 10 inches. A minor bonus is that if I pop the prescription lenses off, the frames become adjustable magnifying spectacles with a focus range from 10 inches down to 6 inches. Two activities—darkroom work and shopping—are lots easier. I have a spacious darkroom and it's nice to be able to quickly switch from close working distance to a couple of meters. Shopping was hard because of having to constantly switch between far, near, and really close vision. My bifocals just didn't cut it; there's a dead zone at the typical shelf distance where my focus is lousy. SuperFocus glasses totally solve that problem for me. This kind of photograph was very difficult for me to make before getting the SuperFocus glasses. When I was photographing the Flying Karamazov Brothers fortieth anniversary show last weekend, I needed to make some "Hail Mary" photographs (above). That's something that's been difficult in the past; arms-length is also in the "dead zone" for my bifocals, so when I'd be holding the camera over my head I couldn't see the screen on the back clearly. No problem with the SuperFocus glasses. Just a nudge of the slider on the bridge. I don't care about being a fashion plate, never have. I dress neatly, but I've never looked to receive sartorial compliments, and the universe has responded accordingly. Three days after getting the glasses, I was at a florist's picking up a bouquet and some middle-aged guy walks back behind the counter, stops, looks at me and says, "Do you mind if I make an observation?" "Those glasses fit your face better than any glasses I have ever seen before." Over the next two weeks, four more strangers went out of their way to stop me and tell me how wonderful the glasses looked on me. I'll be damned. Okay, so much for the pluses. What are the downsides, potential or otherwise? The big unknown is durability. Online complaints won't give you any idea of the frequency of a problem, but you can get a sense of dominant failure modes—a lens that starts leaking or a bridge slider that gets cranky. I'm not sure how real slider complaints are. It may have to do with people's expectations for a mechanical device. A leaky lens, though, is a pretty objective complaint. My optometrist said they've had one leaking lens in the last year and no slider problems. The glasses have a one-year warranty on materials and workmanship. On something this expensive, I'd like more than a year. I mentioned last column that I bought the loss/damage replacement policy. Well, don't. It's even more of a ripoff than most. When the written policy came with the glasses, I discovered that what I was getting for my 15%-of-cost premium was the right to purchase one replacement pair at 50% of my original cost. In other words, I'd still be out two thirds the cost of a pair of glasses. Given the normal markups and profit margins on manufacturing, this doesn't cost SuperFocus a red cent, even if they had to do this for every single policyholder. I brought this up with my optometrist. They agreed this wasn't a good deal, and they offered to either refund the cost of the policy or else, should I need to exercise it, they would eat the cost of new glasses (I took the refund). Going to a high-end optometrist like this, I spent about 30% more than I would have buying the glasses online. I figured that it was worth paying for the extra service and support on a new-to-me technology. I feel I got my money's worth. For those who asked, I got my glasses at For Your Eyes Only Optometry on Castro Street in San Francisco. My doctor was Kathleen Kennedy, and I'm very happy with her and the rest of the staff. She handled my fussiness over the prescription well, and even let me rig up my own light in the exam room to run some visual tests to help me home in on the optimal prescription. What most worries me is how scratch-resistant the lenses will prove to be. I am being very, very careful cleaning them, maybe more so than I need to be. I'm really afraid of scratching the hard prescription lenses or, worse, the flexible liquid-filled lenses in the frame. These lenses are much smaller than what I'm used to, which means a scratch is more likely to intrude into my field of view if I screw up. There are twice as many surfaces to clean. I have no idea how resistant the flexible lenses are. Scratch resistance and flexibility are different material characteristics. The flexible membranes might be more or less scratch-resistant than the hard lenses. I am not inclined to run the tests on my own dime to determine this. The hard lenses clean pretty much the same way any plastic lens does. The membranes are more difficult. The thickness of the frames and their proximity means it's easy to smear grease from the frame onto the lens. The membrane material is more prone to picking up the grease and fingerprints. I have what have been called "magic fingers." My fingertips are so oil-free that I can wipe fingerprints off of lenses with them. These membranes pick up smudges from my fingers readily. Plan on keeping plenty of lens wipes and microfiber cloths around if you're as picky about optical clarity as I am. How well will the lenses hold up? Ask me in a year. I may end up buying a second set of the prescription lenses (they only run $100) just in case. I haven't settled the matter of sunglasses. As I wrote previously, I am fussy about color rendition. Sunglasses need to be extremely neutral or I won't wear them. The ones I've been happy with are slip-ons that Walgreens sells. I buy them ten at a time. They're cheap enough that when one gets scratched up or I lose it, I just grab another one. Prescription sunglass lenses are available from SuperFocus. Problem: They didn't provide my optometrist with a sample set, and I don't know if their "slate gray" is truly neutral (transition lenses aren't anywhere close). I'm going to need to find an optometrist who has a sample, or I'll be gambling $100. I cut some slots in the bridge of the Walgreens slip-ons with hobby knife so that it would fit over my new spectacles. It works. The slip-on covers up the focus slider, but outdoors I rarely fiddle with that. It does, though, look a little bit...ummm...odd. Ctein about to unleash his diabolical death ray on an unsuspecting populace. I figure it's a temporary solution. Hopefully, not the way the 28-year-old black-plastic-sheeting walls in my darkroom were "temporary." I've still got a week to go on SuperFocus' 30-day trial period. If I decide I am unsatisfied with the glasses for any reason, I can return them for a full refund. That is so not going to happen. I am sold. One last matter, that I'm of two minds bringing up. I don't want anyone to get the impression I'm shilling for a product. I figure that all of you are smart enough to know that I wouldn't risk a 30-year reputation for integrity in this business for 50 bucks or so. SuperFocus has a promotional deal. If a new purchaser provides them with the serial number for my glasses, they'll get an immediate 10% discount on their order and I'll get sent a check for 10% as a rebate on mine. They gave me about a half dozen of these coupons to use. If you decide to buy SuperFocus glasses, drop me an e-mail (ctein@pobox.com) before you do. I'll give you the serial number if I have coupons left, and both of us can save a little money. TOP sets its slider to focus on Ctein every Wednesday morning. UPDATE May, 2014: SuperFocus has closed its doors. Ctein can't get new prescription lenses for his glasses, which means at some point he will "age out" of the current prescription. He is quite unhappy about that. LensCrafters is supposed to introduce a line of adjustable focus glasses this year. Ctein doesn't know anything more about them than is what can be found on public websites, but he's keeping his fingers crossed. "This is a photo blog, after all. ;-) "
Joe: "One thing you didn't talk about is that little dial—isn't it a bother to be constantly reaching up and rolling the dial to change your lenses' distance? What do you do if you're looking back and forth, over and over, between two distances? Do you find you're lazy and don't bother reaching up, so you're sometimes not seeing ideal sharpness? Do you have to roll the little dial back and forth for a second to find the exact right setting for a particular distance? "(Also, I'll chime in as a stranger with an opinion on your new frames: it's true, they do look really terrific. Not many faces are right for round frames, but even if you were to go back to traditional lenses, those are the frames I'd recommend.)" Ctein replies: I addressed most of your questions in the article. (If I don't describe something as a problem for me, then it isn't one. Your mileage may differ, of course.) You did bring up the matter of the "dial," though. I have the glasses with the bridge slider. This relates to an important point: the different models of SuperFocus glasses have different engineering designs, and the differences are not trivial. That's one of the reasons for the wide range of prices. People should read the descriptions of each model very carefully before choosing one—don't do it just based on superficial appearance. those look pretty darn spiffy if I say so myself! I call overkill! I have about as challenging a prescription as anyone and the latest version of seamless vari-focal lenses seem completely un-noticeable. In fact having also simultaneously purchased single-prescription reading and mid-range computer glasses, I don't really need either. Those sun shades look like you're wearing welding goggles. I've been looking at these glasses for a few years now, just haven't been willing to pull the trigger on a $1,200 pair of glasses. On the other hand, I just received my Warby Parker pair of glasses. I would say they are great for $95 including the shipping (and they send a pair to a needy child as well). I got a pair for distance (driving), and another pair for computer work (30" or so), which I spend most of my time on. When reading, I just take them off, and bring the book closer. With photography, I just have to adjust the diopter on the view finder to match my computer glasses. "A leaky lens, though, is a pretty objective complaint." Nice pun, intentional or not. When I saw the sunglasses I nearly spat my New Zealand Sauvignon at the screen. The worrying thing is that I have a pair of those somewhere picked off the ground near a Loire chateau. Presumably dropped by a US tourist? I've never seen them for sale in UK or anyone else wearing them for that matter. Ctein, I'm interested for some of the same reasons you were, but I'm confused by your comment that there are twice as many surfaces to clean. Do the glasses come apart so that you clean the prescription element separately? "Plan Ctein From Outer Space"
"The Cteiness of Strange (ers) (ness)"
On the being complemented thing: they make you look like a cross between an older John Lennon and Dumbledore. So, wrell, obviously people like that. I find that the extreme slant of windshields in modern cars cause immense amounts of reflection. The only way I can properly deal with this is by using polarized sunglasses. Living near a large body of water, the sunglasses usually come in handy near sunrise or sunset as well. I just won't use regular sunglasses anymore. You could adapt some camera lens polarizing filters to your new glasses. You would be adding rotating elements as control units in addition to the slider on the bridge. Could you be more camera geek with any other piece of eye wear? I fully agree with the random strangers. They do look good on you! You look like a state-of-the-art Stereo Camera. Did you get matching lens caps? I am glad to hear your life as a photographer will be continueing, and with a lot more ease. I have not see the Flying Karamazov Brothers since they used to perform at the Norwescon science fiction conventions in Seattle. Am glad to see and hear they are still delighting people. Is the whole original group still performing? Ctein, you are one handsome, and talented, SOB. LOL. the I'm-watching-this-darn-eclipse contraption is a hoot but yes, where is the hat i need to drop my dime in? Fitovers sunglasses (www.fitovers.com) are a great polarized sunglass solution for the cheapskate eyeglass wearer. I have a pair with amber lenses for skiing and a pair with neutral grey lenses for driving and cycling. Not your call… for me. Glad the alternatives work well for you. Well, they've come down in price: frames plus lenses run from $525 to $775 on the SuperFocus website. The particular model and style I bought is intermediate in price. Not saying they're cheap; 4-5 years ago, I couldn't have afforded even that. Heinlein said a lot of stupid things that people mistake for wit and cleverness. That's right. Check out the details on the SuperFocus website. I used to be big on polarized lenses until I realized they kept screwing me up because I wasn't seeing things the way my camera (sans polarizer) was seeing things. So, I abandoned them about 25 years ago. "She handled my fussiness over the prescription well, and even let me rig up my own light in the exam room to run some visual tests to help me home in on the optimal prescription"
... don't mess with The Ctein ! Ctein, for the sunnies try Maui Jim grey polarised rx. I prefer the brown and as an optom in the UK, prefer it as it "brightens up" the dull UK sky..:-) alternatively Zeiss will do a colour neutral rx sunglasses lens. It's very grey. Was intruiged by your initial posting first as most of my px at -4 are in contacts, and multifocal contacts at that. Best success so far is with a lens from France called the C2 multifocal (Precilens labs). We can't get your current lenses in the UK ....yet but I'm on a search. Pip pip! "I'm reminded of the comment by Robert A Heinlein (I think), who said: An honest politician is one who when bought, stays bought. :)", by Paul Van. Yep, definitely Heinlein. I think from "The Moon Is A Harsh Mistress". I like them too for the same reason as I have very wide peripheral vision. Unfortunately, those nice wide frames are no longer available. Both Pearle, where I purchase my glasses, and the sales part of my opthalmologist's office told me they're no longer made, that the new, tiny, horizontal lenses are what "everyone wants." Money quote: "As seen on TV." I suspect the truth is that those nice wide lenses which once were the in-thing (everyone, especially motorcycle cops, wanted to look like an aviator), were simply phased out by the optical industry so as to generate a demand by those whose current eyeglasses are otherwise perfectly fine. The current style will will also likely be replaced by something new in a couple of years. Speaking of style, the round, wire-framed eyeglasses similar to your new specs which John Lennon sported and made immensely popular with the youth when everyone was wearing square tortoise-shell frames (remember Walter Cronkite?) were called "granny glasses" because they harkened to an earlier, gentler time. I still have a couple of them in a drawer somewhere. Finally, Thanks for the update and I'm glad you are enjoying your Superfocus lenses but I have doubts about their ultimate practicality. The ability of being able to refocus one's lenses with a flick of a switch whenever one wants is likely to become a necessity - I'm constantly looking at subjects at different distances - and I only have 2 hands. So I look forward to your next review. I am very happy for your success. My complaint is with SuperFocus advertizing. I went to their site to get details for maybe 60 seconds. Somehow they tagged me and now, no matter which internet site I view, I see Penn Gillete's face mugging me in just about every single ad. Spooky. I would never ever consider SuperFocus because of this ad assult. Ctein. Your face and beard has great character. You should have one of your seasoned photograher friends do a b/w photo of you with the round, framed glasses. Yeah, if it's me vs. a doctor, you can guess who wins. But this wasn't even a fight. I needed to rig up a pinpoint light to bring out certain aberrations that weren't obvious in a standard eye chart. Which is why the first prescription wasn't optimal. I may do whole column on this, as it directly parallels issues that arise in the design and testing of camera lenses. @Ctein: Photography is my avocation; BA English/photography. I made my bread and butter as a NYS licensed optician, with a related degree. I solved this problem with an inexpensive solution: monovision. I had monovision eyeglasses, and now monovision bi-lateral implants - which is permanent, and works exactly as I want. The mark-up on those glasses rivals jewelry margins. A bit off topic. . .
Nice self-portraits, Ctein. I'm wondering how you did it. Because not a shadow of a camera or a tripod shows from the reflections on either your old or new glasses. Is the camera peeking from behind the sheet? I like the first portrait better. But only because the shades beneath your SuperFocus glasses are distracting. (My Spanish language teacher had clip-on shades over his glasses which he used to flip up visor-like.) The second portrait is more in character, though. You look too benign in the first. Any thoughts on using circular polarizing filters for when taking portraits of bespectacled subjects, to attenuate reflections? Oh come now. 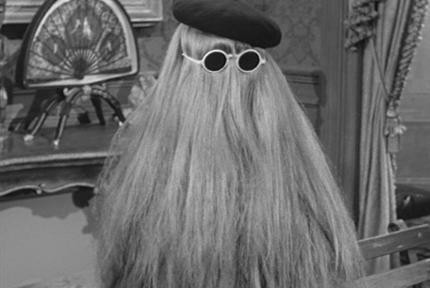 Man who hasn't had haircut or shave since 1968 worried about look of specs frame. Having just been fitted with a "fancy" hearing aid, I appreciate being able to experience the wonderful world of hi-fi. It's nice to listen to jazz again on the tube amp and fullrange speakers that I spent way too much time on building. I hate my current eyeglasses situation. Ctein hit it on the head as far as describing the pitfalls of eyesight vis-a-vis middle age. I've got seven or eight pairs of glasses--each pair serves a "special" purpose. Problem is, I can't ever find the pair I need. Forgetfulness--another middle age malady. Uhh, it was entirely an accident. It just happened that my arm (and the camera it's holding) aren't in front of the reflection of the window in the lenses. I'd love to claim that I did this with brilliant foresight, but honest to God I didn't even think about it. The one modestly clever thing I did do was extend my arm about half a meter out, and turn at an angle to the mirror, so I was photographing myself on the diagonal, rather than facing the mirror head-on. That way the camera is outside the field of view. How do you frame the photo when you're doing that? You angle your head and your camera so that the lens appears to be pointing directly at you in the mirror, and then you fire off a whole burst of frames, and then you look at the results on the back screen to make sure you got the framing right. Delete when bad, repeat until good. Yay, cheap electrons. I don't believe we've ever met personally (if we haven't I forgotten, my bad), so you really don't know what my personality is like. You cannot judge what someone is like in person from their writing. For one thing, I am much taller. Too bad the shape wouldn't work on me at all, but they do look great on you, Ctein. The hint of cyberpunk IMO also suits (hope you're not offended by that). Congratulations! and good luck with them. I look forward to the odd update down the road. Especially curious how they are at night or in contrasty, harsh lighting--whether they are noticeably any less transmissive or flare-prone. “An honest politician is one who when he is bought will stay bought” was said by Simon Cameron, Abraham Lincoln's Secretary of War. Predated Heinlein by a fair margin. See "Team of Rivals" by Doris Kearns-Goodwin. Ctein's new glasses remind me of the U.S. Army glasses I was issued to fit inside of a gas mask (before gas mask insert lenses were available). They seem just fine under those conditions. I don't see excessive flare or reflections. ... are belong to ME. What part of "diabolical death ray" did you not understand?